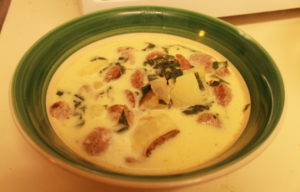 There is nothing better on a cold day than a bowl cup of soup, but if it’s this Olive Garden Soup recipe for Zuppa Toscana, I will gladly eat it any time of the year! As I was looking through my pantry and freezer I noticed that I have everything for it except potatoes (how did I run out of those?) and kale. I also have some crusty bread in the freezer that comes par baked, I just need to finish it off in the oven. We are currently doing our $50 a week grocery challenge for the month of June so I will have to wait until next week to make this, but in the mean time I wanted to share the recipe for one of my favorite soups at Olive Garden. The recipe calls for a pound of Italian sausage, but if you are frugal like I am then you can get away with a little less. Just add in an extra potato or two to make it a bit more filling. I like to buy meat in bulk because it’s cheaper by the pound that way. I then divide it into family size portions, wrap and freeze. I picked up sausage a few days ago for spaghetti this week so I figured it was the perfect time to plan for this delicious copycat soup recipe next week. I don’t buy my bacon in bulk because I don’t use it that often, so what I do is just buy a package on sale, divide it into 4 portions and freeze. That way it’s perfectly portioned for those recipes that call for just a few strips of bacon. We grow kale in our garden so in the summer and when the garden is ready I will have plenty available. If you don’t have kale you could substitute with other greens such as fresh spinach or swiss chard. Cut the sausage into thin slices and brown in a large pan or dutch oven until no longer pink. Remove sausage with a slotted spoon and set aside, drain grease from dutch oven. In the same dutch oven, fry bacon until crisp. Remove bacon and set aside, leaving a few tablespoons of the bacon grease. Saute onions until soft, about 5 minutes. Add garlic and saute about another minute. Pour the chicken broth into the Dutch oven with the onion and garlic mixture; bring to a boil over high heat. Add the potatoes, reduce heat to a low boil and cook until fork tender, about 15 minutes. Reduce the heat to medium and stir in the heavy cream and the cooked sausage; heat through. Mix the spinach into the soup just before serving. Add chicken broth and bring to a boil. Add the potatoes, sausage, salt and pepper. Reduce heat slightly and cook until potatoes are tender, about 15 minutes. Reduce heat. Add the heavy cream, kale and red pepper flakes. Simmer until heated through and kale is wilted (about 5 minutes). Stir in bacon. Ladle into bowls and top with shredded cheese before serving. Goes great with any kind of crusty bread. You could use hot Italian sausage instead of mild, just omit the red pepper flakes. 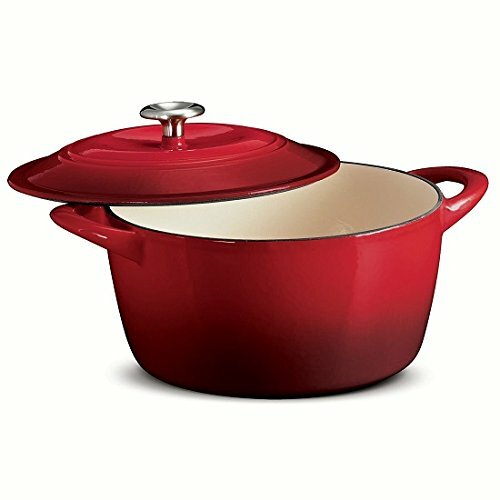 I like to cook soups in my enameled cast iron dutch oven similar to the one shown on the right. It is heavy duty and I love how it evenly distributes the heat. Since soup always seems to taste better the second day, this recipe is definitely worth doubling. Since soup always seems to taste better the second day why not make a double batch for planned leftovers? To save money you could probably double all ingredients except the sausage and bacon and still have a hearty soup with plenty of flavor. I’m very fond of cooking with cast-iron pots, especially curries. This soup is new to me – and I love Italian cuisine!